Take free time today to admire Côte d’Azur-with its enchanting yachts, glamorous villas, and famous events. Known also as the French Riviera, the spectacular Côte d’Azur stretches along France’s Mediterranean coast from Toulon to the border of Italy. Guided Optional Excursions include a visit to the ancient Roman aqueduct of Pont du Gard.Explore Avignon on your own for the city’s art and culture, theatre, and museums. Be sure to snap photos of the captivating countryside, historic monuments, and the medieval Pont Saint-Bénézet. 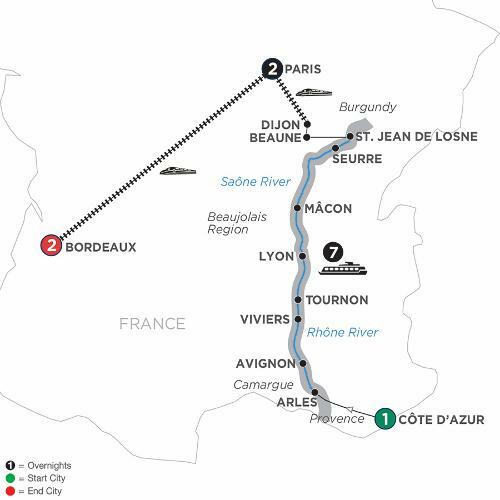 DISCOVERY Join an Onboard Lecture hosted by your Master of Wine while sailing to Viviers. DISCOVERY Enjoy an Onboard hocolate and ine tasting hosted by your Master of Wine while sailing. Enjoy a leisurely cruising day along the majestic Saône River. DISCOVERY Later, enjoy a delicious wine and cheese tasting hosted by your Master of Wine while sailing to St. Jean de Losne. DISCOVERY Visit a typical Burgundy wine cellar. This morning.after breakfast take a high speed train from Paris to Bordeaux. DISCOVERY Drive to the World UNESCO site of Saint Emilion, famous for its vineyards and for its intact medieval town. Enjoy a wine tasting in a local wine estate, and a wine blending workshop followed by a food and wine pairing lunch. In the afternoon a guided walking tour,will show you the mediavel town of St.Emillion. Afterwards, visit the Cordelier Cloister, where you will admire the spectacular network of underground cellars and passages where superior sparkling wines have been produced since 1892.